Introduction In its present form the custom of displaying figures depicting the birth of Jesus Christ owes its origin to Saint Francis of Assisi who made the Christmas creche or manger for Christmas eve of 1223. However, as early as the fourth century representations of the nativity of the Lord were painted as wall decorations depicting not only the infancy narrative accounts of Christ's birth, but also the words of the prophets Isaiah and Habakkuk taken to mean that the Messiah would be born in the midst of animals in a manger. 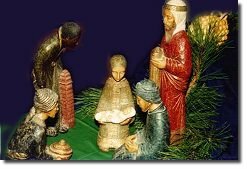 The blessing of the Christmas manger or nativity scene, according to pastoral circumstances, may take place on the Vigil of Christmas or at another more suitable time. When the manger is set up in the home, it is appropriate that it be blessed by a parent or another family member; the shorter rite may be used for this purpose. A form of this rite is also found in Catholic Household Blessings and Prayers. The blessing may be given by a priest, deacon, or a lay minister. This rite is especially appropriate for use when the blessing takes place in the home and is given by a family member. The birth of Jesus. In those days a decree went out from Caesar Augustus that the whole world should be enrolled. This was the first enrollment, when Quirinius was governor of Syria. So all went to be enrolled, each to his own town. And Joseph too went up from Galilee from the town of Nazareth to Judea, to the city of David that is called Bethlehem, because he was of the house and family of David, to be enrolled with Mary, his betrothed, who was with child. While they were there, the time came for her to have her child, and she gave birth to her firstborn son. She wrapped him in swaddling clothes and laid him in a manger, because there was no room for them in the inn. Isaiah 7: 10-15—The birth of Emmanuel. Lord, bless all who look upon this manger; may it remind us of the humble birth of Jesus, and raise up our thoughts to him, who is God-with-us and Savior of all, and who lives and reigns for ever and ever.